UPDATE: Video & Write Up! Mew, on Pokemon One a Day : SERIES FINALE! So…where to begin? With Mew, I knew I had to go out with a bang. Mewtwo being one of my favorites and Mew as the series finale meant I went through hell of a weekend, and then some. With Dragonite, Mewtwo, and Mew, all three heavy hitters and favorites waiting to be unleashed, I wasted no time and made sure I wouldn't lose out my 152 streak of consecutive illustrations due to over ambition. Even still, releasing Mewtwo and Mew came down to the wire, both being posted within minutes to 12. I couldn't imagine of losing the streak after getting so far…I don't think I could forgive myself if that happened - but my ambition was met by determination and now I stand atop the mountain and look back at everything I've created with pride. For Mew, I had envisioned the concept of a stained glass window for longest time. It felt fitting from the first conception of thought, and I I never budged from the concept nor did I ever think of anything else to do as an illustration. In the end, it was just the scope of the vision that had expanded. As you may recall, Snorlax was given a lot of love and attention for a number of reasons. He's a personal favorite and it also gave me a chance to incorporate several other Pokemon from other generations into the mix. I saw that I could do the same with the platform that is Mew, except round out the legendaries for one final hurrah. Now, the first thing I must absolutely address is why so and so legendary didn't make the final illustration. Others barked their anger while more rational, civil people asked like normal human beings. 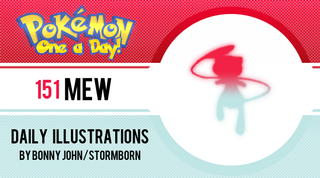 The reasoning as to who made the cut is simple - the story I am telling here revolves around Mew first and foremost, and the legendaries here fit the bigger picture. The legendaries that didn't make it would also not have fit literally, into the actual frame and vancas of the work. I already took liberty with the size of the work by cutting into the border that frames every work of the series. So that said, let's take a look at this mural of sorts. Everything was created and placed in specific key locations with reasoning to help tell the story but also simply be aesthetically pleasing to the eye. You wouldn't believe how long it took to simply get the placement of everything down - Of the 12 hours I spent on this piece, I'd assume that more than half of that went into organizing, and arranging, then re-arranging all the pieces over and over again. I looked for ways to showcase the best level of symmetry as well as give the selected players appropriate amount of space to thrive. Of course, all of this had to be second to Mew. Even you, Arceus! Back in the day, and obviously still to this day, painters use a lot of symbolism and arrangement of objects as well as depiction of entities with attention to their size on canvas to give importance to their subjects. All of that can be seen here. Mew as the focal point is dead center of the work. . Surrounding Mew is Arceus' ring, whose round shape zeroes in on the Pokemon of the Day, as well as the spokes of the wheel. Mew is flanked by the gods above, the deities to his sides, and is being supported by the mover of continents. One of the reasons why I waited a day to post this write up was to give you all a chance to interpret the work for yourselves. With the means of expression of Mew being a stained glass window, did you feel there was a religious significance to the work? What story do you see? Mew:I tried a number of poses before settling on this one. When we think of Mew, we may think of his bubble that he floats around in sort of like a vehicle. Many have speculated that Mew, who is usually bundled around in the fetal position, resembles an actual fetus in ways. In that way, I see the bubble as sort ofa womb, such as a belly that rounds out expands to house the life inside of it. Mew's tail can also be seen as sort of an umbilical cord which further solidifies that thought. Thus, Mew in the center of Arceus' ring (womb) is the child born by the God of all Pokemon/Universe to be the life giving ancestor to future species and generations. Mew's designation in the Dex is the "New Species" pokemon but its ability to use any move and blood is indicative of it's ancient origins. Before we had Arceus, the closest thing we had to the "first" Pokemon is Mew, and this piece pays homage to that with nods to the modern/current lore of the games. When it comes to stained glass windows, we think of religious artwork. When Arceus was thrown into the mix, subconciously the whole concept of presenting the godliest of all legendaries was the focus. Thus, maybe potential legendaries were thrown aside. Arceus, the creator, begins this entire mural based on the theme of creation. I should note that there isn't some sort of religious connection to any real world beliefs. There will be comparisons for sure, but that's just how coincidences work. As Arceus is the forerunner of the mural and the lore, he takes the highest spot of the mural, and is given a bubble larger than any others, almost like a halo of sorts. The triangle behind him OBVIOUSLY connects him to the illuminati. I'm kidding. The triangle connects the three together. The pure black of the triangle symbolizes that Arceus came from nothing, when the world was empty and black. Flanking him is the deities he created and designated to control time and space, Dialga and Palkia. Notice their "bubble" is smaller than Arceus's but bigger than anyone elses - again, the small details all come together and are important in telling this story and being true to the lore. As created by Arceus, these two deities,are connected to Arceus' spokes from the ring in the middle so the visual connection is made right there. They share the same starry sky as their creator and of Mew to show their abilities to be godlike in comparison to anyone else in the mural. Again, this is why legendaries like Ho-oh and Lugia, who were actually in earlier drafts, were cut. They are certainly awesome legendaries whom we adore and admire, but the level of legendary here is STUPID high, god-like levels. Designated the Renegade Pokemon, Giratina can be seen as the "devil" in the Pokemon world. Again, this is coincidence (or maybe not…haha), but Giratina, one of the original trio created by Arceus was cast away to his own realm, the Distortion world, for being too "violent". This story is similar to that of Lucifer, one of God's angels who was cast from heaven into his own realm, Hell. And again, Giratina is the RENEGADE pokemon. I depicted Giratina in his origin forme as the creature is residing in what I designated the Distortion world as seen by the blue-purple portal like surroundings of his space. Connected to Giratina are literal chains, which can also be seen mimicking the tentacle like protrusions that come from his back. In keeping with the symmetry and balance found in the work, Giratina is opposite of Arceus, and figuratively and literally at the bottom of the work, which depicts his less than favorable status. These three spirit elves are born from Arceus himself and imbue the world's creatures with knowledge, emotion, and willpower. I immediately saw them to have a visual connection the Mew - they have large heads with small bodys and long flowy tails. It's not described in the games, but personally I believe there is a connection between the three and Mew. They are all also Psychic types. Thus, I see Mew as their originator which is why I had them circle the womb and fill in the space of the wheel. Above Mespirit is a third wheel, with the 151 designation. Fans of the One a Day series know that the border that frames the work features the number prominently in the bottom right of the space. I had to move it for obvious reasons and I thought that spot was the best fit, and also helps balance against the three circles occupied by the elves. Keeper of the Regi trio, Regigigas was depicted without his followers as they weren't needed for this creation story in particular. Regigigas was enough, and as you could imagine, was positioned in the way of Atlas holding the world up. In this case, Regigigas, who shares the same visual design as Arceus with the yellow, black, and white, represents the mover of continents. At his waist you see green, brown-red, and blue. Green representing sky/wind/air, red/brown representing earth, and blue representing water. This way, the earth that Regigas has shaped can be seen as part of his interpretation, in a very subtle way. Fortunately for the yin-yang duo, Resh and Zek survived the chopping block. Like Hooh and Lugia, these two are closely related to their region more than the general world lore. However, I soon realized they are keepers of a major worldly desire - harmonic balance. Yin and yang - how two halves fit to make one whole. This whole piece is formed in symmetry, and Reshiram and Zekrom bring it futher home. I wanted to incorporate the yin and yang symbols but found it to be a bit difficult/impossible for their bubbles. Thus, I resorted into filling in one bubble as the opposing dragon's main color. Bam! Yin and Yang symbols Pokemon style! Simultaneously, Mew is flanked by two creationist trio of gods. What? You thought that it was Kyogre, Groudon and Rayquaza who were the only creationists? Well, that's partially true. In my interpretation of the Mortality trio of Xerneas, Yveltal ,and Zygarde, they are creationists in their own right. One side features the physical manifestation of creation, and the other the metaphysical forces of creation. With Rayquaza, Groudon and Kyogre, you have creatures born of air, land, and sea, that help created the physical form of the world. With X, Y, and Z, you have the creatures that releases life into the world, (birth), destruction (death of life), and Order (the circle of life). This trio when awoken reintroduces to the world mega evolution. In the basic sense, mega evolution can be seen as a "rebirth" for the Pokemon. A new type of creation is seen in the self in that regard. Thus, the two sides are equal in power in my eyes for their respective domain over the physical and metaphysical. Something to note here is that the bubbles for all three are the same size. I was extremely cautious and wary to have the three stacked like such because I didn't want people to think I felt anyone Pokemon was stronger than the other in lore. So, to combat the fact that one person will end up in the bottom, the bubbles were made the same size but more importantly, they all overlap one another, which means they all share the same space. The only acceptable case of power in hierarchy is Zygarde and Rayquaza, who sit atop the other two as the trio masters. If you notice with their "disciples", they have halos over their heads which further glorify their power in the lore. Speaking of which the color of the halos, and the bubbles in general are all yellow, in homage to the center Arceus ring. Yellow also fits as the specific shade/hue is similar to gold, which we relate to royalty. Filling out the bottom two columns are what I like to call the teeny legendaries. I would have placed these within the ring of Arceus but it would've gotten too crowded, the elves were already there, and that they didn't have a connection to Arceus per se. The inclusion of the Tiny Legendaries is simply paying homage where it is due. Mew started a trend for every generation in that a smaller, cutesy type of legendary with a similar body type to it would be introduced. The Pokemon seen below are those who follow in the footsteps. With the exception of Manaphy, not only do they all have similar body types and cute nature/design, they are all part psychics, like Mew. They are placed in the second to last bottom row as they are the least powerful set of legendaries in the mural. Although Giratina is weaker, because the mural acts as a scale of sorts, putting the tiny legendaries on the same row would create too much of an open space underneath Kyogre and Xerneas, as well as haveing them in the same row as Giratina would depict a negative connotation that they do not carry. The work as a whole was treated with a lot of love and care, and plenty of detail that required a lot of patience and attention. Everything came along nicely after the blueprint was set and the final act was to use a highlight tool to give the appearance of the windows shining light for the creatures involved. Obviously, Mew was given the most light which helped in such an amazing dramatic fashion I felt I got lucky with. And that friends, was how this stained glass window mural was born, and how I locked up illustration number 152, sealing the deal on a combo consecutive streak on May 08, 2014. Wow, I thought Snorlax's write up was long. If you made it this far… you're a trooper. Thank you! Wow, this is going to be the last time I get to say this…but I'll do it with a smile. Thank you ladies and gentlemen for tuning into Pokemon One a Day. It has been my privelege and honor to illustrate this journey with you all. Thank you for everything! Good night! For now, enjoy the 12+ hours that is Mew, to wrap up this series you guys have stood besides me with. That's 151 straight illustrations. Tonight, I can sleep sound. There is not enough thanks to be said on my part. You guys have been nothing short of amazing. I owe you all a lot, and whether you know that or not, I do and have cherished my time here thus far.